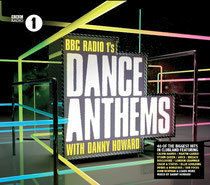 While the rest of the population glumly shuffles into 2014 carrying the weight of an indulgent holiday period, Danny Howard hits the ground running with a brand new album, ‘BBC Radio 1’s Dance Anthems With Danny Howard’. The release features 40 of the biggest tracks from the likes of Martin Garrix, Fatboy Slim, Avicii and Breach spanning across two CDs, all mixed by Danny himself. Alongside hits of 2013, Danny has dipped into the underground to deliver tracks from the likes of DVBBS & Borgeous, London Grammar and Monkey Safari. Popular in the dance music scene and with his Saturday night show on the nation’s biggest radio station reaching millions every week, 2013 was a good year for Danny Howard, looks like 2014 is starting off pretty well too. Check the video below.